This splendid but fairly gentle walk takes us up to the summit of le Pinet, the highest part of the western ridge of the Alpe which is a stunning viewpoint that overlooks our starting point. After the inital ascent to the col d'Alpette, the route follows a line of cliffs on a superb path through the forest, and the recommended descent takes a thin path back down into the pastures of l'Alpe which allows us to explore a little more of the area. You don't need to carry a lot of water for this trip, as there is a tap outside the refuge where you can fill up your bottles on the way up, and on the way down. Find your way into the centre of the hamlet, either by following the road, or preferably by following the footpath that cuts out the bend in the road. A sign post indicates the routes to the Grotte-Colon to the north, but our route ascends to the east towards the cirque wall. It is well route-marked, being part of the GR9. The stony track ascends steeply between two pastures. At the top of the pastures, as the path enters the forest, an alternative, and newer, track leads off half-right. They both join up again a few hundred metres, but the latter is to be preferred as being less stony and easier on the feet. The track ascends through the forest, in a somewhat uncompromising way, but after half an hour you will pass close to the base of the cliff, and half an hour after that you will reach the col de l'Alpette (1547 m) at a fence, with a synclinal valley before you. 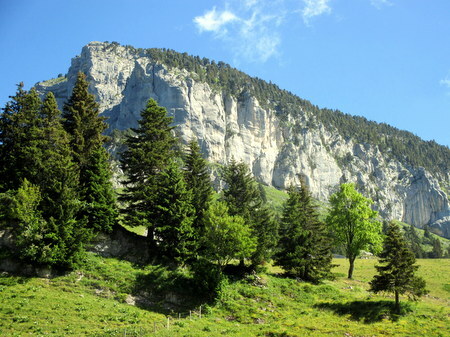 This is indeed a beautiful spot, with high mountain pastures in front, the other side of the valley rising steeply to the crest with tree-covered lapiaz, and high cliffs protecting the Mont Granier plateau on the left. We follow the GR9 half-right down a shallow valley towards the Cabane de l'Alpette and the Habert de l'Alpette nestling in their sheltered depression, which are reached after five minutes. Here you can fill up your water bottles, and stop for a second breakfast, inevitably shared with the bergerie hens. From here, we follow the GR9 south past the bergerie, and ascend into the forests. After ten minutes of pleasant walking through the exquisite dwarf pines and clearings, there is a large cairn, with a sign post pointing off to the right for le Pinet. Take this path, which after ten minutes starts to climb. Before long it starts to follow a line beneath cliffs which contain a number of cave entrances, some of which link into the underlying 60 km long cave system. This is a delightful path, with the valley deepening on the right, and the cliffs become higher on the left. After about an hour, the valley shallows, and a short ascent leads onto a plateau area, with the path to the summit going off to the right. The summit cross is reached some two and half hours from the car. As one would expect, the views from the summit are outstanding all round including a view of one of the 2016 landslips on Mont Granier, and a aerial view of la Plagne below the sheer 400 m cliffs. It's a wonderful place for lunch, and tends to be less frequented than the main tops of Chartreuse. You can return the way we came up, but a more interesting descent is to make your way down towards the remains of the haberts de Barraux, on the GR9. However, you do need confidence in your ability to pick your way along a path which is very thin in places. Make your way back to where the ascent path emerged from the valley, and take a thin path that parallels the top of the cliffs. After ten minutes or so it starts to swing to the south running parallel to the main valley. The occasional cairn will be picked up, and a couple of junctions passed - keep left each time. After a quarter an hour the path starts to drop more steeply towards the floor of the valley which is reached after five minutes. Turn towards the left and make your way across the valley as best you can to reach the GR9 in the area of the remains of a few habitations - les haberts de Barraux. Turning left takes you back to the col l'Alpette. An easy descent will then get you back to the car some 2½ hours or so after leaving the summit.